In his early years as a boy from Kolkata- India, Gazi was an outstanding student. Scholastically gifted, he aced every examination, securing the top ranks of his schooling years. Destined for greatness, a storm was brewing in the backlines; his father was struggling to keep up with the increasing fees of his education. Unfortunately, Gazi had to drop out of school at the age of 12 and take to begging to get by. For many, this circumstance is the deciding draw; the hand you fold on, not Gazi. 400,000 children are forced into begging in India. Begging made him realize that this unfair circumstance can be helped and he looked for a job. The 12-year-old took initiative and began earning a small amount as a rickshaw (pull-cart) driver; all in light of one goal- “a portion of my savings goes to starting my own school”. The sheer willpower to succeed inspired Gazi, and in the later years he learned to drive and became a taxi driver. With the increase in his income, he then set up the ‘Sundarban Driving Samiti’, a training school for youth to help better their chances at earning a greater income. The simpleton Gazi taught over 400 students this way, and all with just one condition; those trained would help him achieve his dream- to start a school. His passion for education was what clicked with the people he surrounded himself with. Evident, as today Gazi runs not just 1- but 2 full-fledged schools and an orphanage. “I am Gazi Jalaluddin, a taxi driver. I am a self-made man. As a child, I begged on the streets and rode a pushcart too. When I grew up I learnt to drive a taxi I had a single wish – to go to school and study [however] it couldn’t be fulfilled. Today I have opened not one, but two schools. Other than supporting my family and educating my sons I have educated kids in the Sunderbans too so that no other child is forced to beg again. I have another dream – to start a college and I am sure my son will make that happen. I, Jalaluddin Gazi, want to eliminate illiteracy from India”. Passion is contagious and this is a testament to it. At any point in his story, Gazi could’ve dropped his social mission and lived for himself. He knew the need for change and in the words of Gandhi; he is the change. So much so that in 1988- he and his wife Tasleema converted their two-bedroom house to start their first project: ‘The Sunder Shikshayatan Mission’. With the vision to never deprive a child of an education, the duo began with 22 children and 2 teachers. From not being able to muster more than 1 meal per day to successfully providing the gift of education to 500 students while employing 25 teachers- Gazi has done it. 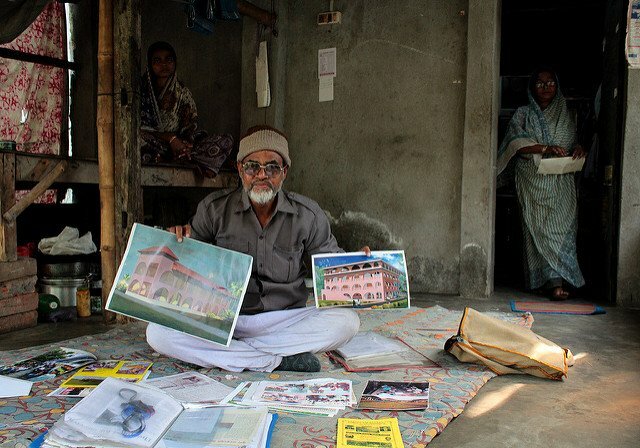 His dream to educate; all those with seemingly no access to it came true. Gazi is in every way the definition of a hero and his dream to eliminate illiteracy resonates with ours.